The first time you build a fire in the oven is exciting. Remove the can from the rear vent, and cut and fit a piece of the ¼-inch wire mesh over vent to act as a spark arrester. Build a small fire and keep it burning steadily so the adobe warms slowly and bakes out any remaining moisture. Hairline cracks will likely develop when the oven is heated, but they can be sealed with coats of exterior latex paint later. The next time, build a fire as directed for cooking to test how the oven holds heat. The oven’s surface will become hot to the touch. Let the fire die down, use a hoe or shovel to pull out the coals into a metal bucket partially filled with water, sweep off the brick surface with a damp broom, and check the temperature with an oven thermometer. Initial temperatures will often be about 700° – too hot for cooking. Block the vent hole with the can or a damp rag, and remove and soak the door in water. Replace the door and periodically monitor the temperature for several hours to get an idea of how your oven performs. Leave oven door open for cooling. 0 to 10 minutes: Screen vent and open door. In center of oven, mound 6 to 8 sheets of crumpled newspaper. Lean 2 or 3 handfuls of kindling wood, including some 1-inch-thick pieces, tepee-style against the paper. Ignite paper, and when kindling is burning well, lay 2 or 3 more handfuls of kindling on the fire and top with 3 or 4 logs (3 to 4 in. thick and about 1 ½ ft.). 20 to 40 minutes: When logs begin to burn, add 6 more logs (4 to 5 in. thick), but be careful of heat from oven door – it can singe hair. Toss about half a 10-pound bag of charcoal briquets between logs. Let fire burn about 1 hour, then add remaining briquets. Burn until most wood is gone, about 3 hours total. Occasionally poke fire to keep air circulating. At about 2 hours and 50 minutes: With a shovel, scoop hot ashes into a fireproof metal container partially filled with water. Quickly clean oven floor with a wet mop or wet towel tied to a pole. 2 hours and 50 minutes to 3 hours: Set oven thermometer on floor just inside door. Close door; block vent. Check after 10 minutes. Temperature should be between 700° and 650°; then it drops quickly to 600°. About 4 hours: During the brief period of high heat, bake pizzas. About 5 hours: In the next phase, put meats and vegetables in to roast. Bake bread when oven heat is most constant. 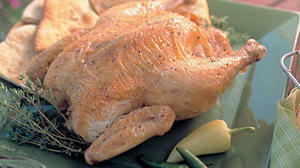 Meats brown best when oven starting temperature is 500° to 450° and heat is regulated by the oven door. But for roasting that requires less attention, wait until temperature drops to about 400° to allow more time for meats to cook. About 5 1/2 to 6 1/2 hours: Bake bread when oven heat is most constant.